You could always heat up a can of chili to stymie the cold, but it’s a whole lot easier to slide into the warmth of this hybrid jacket. It combines modern construction techniques with age-old insulation to create a warm, performance-oriented jacket that’s waterproof, breathable and insulated. Patagonia made the shell of the Ukiah Down Hybrid Jacket from a supple 2-layer 100% polyester fabric coated with a DWR (durable water repellent) finish to fend off moisture and increase durability. 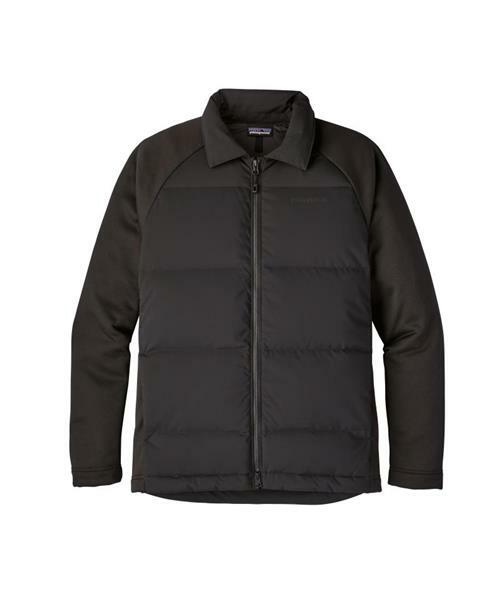 Warm, 600-fill-power Recycled Down, reclaimed from duck and goose down products, insulates the jacket’s core, while soft mesh-face fleece throughout the shoulders and arms reduces bulk and allows your arms to move freely. The classic shirt-collar design converts to a stand-up collar with a snap closure to protect your neck and seal in warmth. It has handwarmer pockets that close with zippers and a zippered rear stow pocket that’s ideal for bike commuters. Hip length with a drop-tail hem.